Austin’s NBC affiliate KXAN is having a fun time playing victim because Time Warner isn’t paying some fee for the honor of carrying an NBC affiliate. While KXAN was whining about how unfair it is they neglected to mention what other networks are being paid by Time Warner, leading me to suspect the sum is somewhere around zero. I have plenty of choice words to say about this, but that is not what has agitated me. Since I can’t watch NBC on TV, I use your website to watch the shows I want to watch (take THAT, local advertisers!) In return for this service, I have to watch online commercials as part of the viewing process. This is generally well-done, though occasionally it seems like the ads cut in a little earlier than they should and lines of dialog are missed. This is still just background. What CHUCK! agitates me CHUCK! is a CHUCK! commercial for CHUCK! some lame show CHUCK! that I don’t CHUCK! even CHUCK! want to CHUCK! watch. The CHUCK! commercial in CHUCK! question is for CHUCK! the CHUCK! CHUCK! show Chuck CHUCK!. It involves some kind of CHUCK! music with CHUCK! occasional CHUCK! interjections CHUCK! CHUCK! of characters CHUCK! screaming the CHUCK! titular CHUCK! name CHUCK!. I see this CHUCK! commercial CHUCK! at least 5 times CHUCK! per viewing, CHUCK! and it’s CHUCK! really aggravating that CHUCK! it CHUCK! both has an CHUCK! annoying sound and CHUCK! CHUCK! plays with a volume CHUCK! significantly louder CHUCK! than the show I’m CHUCK! watching. The commercial covers a few really lame jokes, and after seeing it multiple times in a row I’m pretty certain that Chuck isn’t the show for me. I’m sure the ad’s creator is confident that it’s "attention getting", but in this case the ad only draws attention to the fact that I’ve already seen it dozens of times, the jokes were stale the first time I saw them, and I don’t like the commercial. On the TV, I just mute during commercials and the problem’s solved, but I’m a bit more captive at my computer and it’s easier to just wait out a commercial. It has driven me to the point where even if I accidentally started watching Chuck, the first time someone said his name I’d think of the commercial and change the channel. Perhaps you could do some work to ensure your viewers don’t have to watch the same commercial too many times in one viewing session, and also pass along to your advertisers that some viewers are less inclined to ignore ads in the online viewer because it’s inconvenient. The dialog is trying to be helpful. 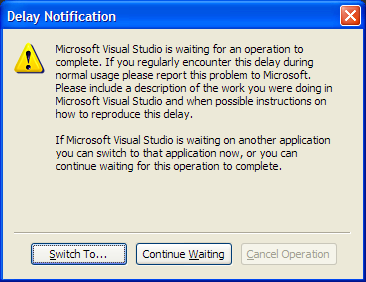 Itâ€™s telling me that VS is busy, and it gives me three choices: switch to the application thatâ€™s holding things up, wait a little longer, or cancel the operation that caused the delay. I have never seen the â€œCancel Operationâ€ button be a valid choice. â€œSwitch Toâ€¦â€ is worthless because 9 times out of 10 VS is the application that is causing the delay. So, this dialog is little more than VS making fun of me and telling me that Iâ€™ll just have to wait for itâ€™s oh-so-important mystery operation to complete.